I hadn’t heard of the EGO brand so I was a bit sceptical about their claims of having the most powerful cordless blower on the market. However, after using the blower I have to say it is impressive and rivals its petrol-powered competition. At first glance it looks like a rugged piece of equipment that is built to take the punishment it will endure in the hands of a contractor. A huge 56-volt brushless motor powers the turbine fan to provide a massive air volume of 980m3/h in Turbo Boost mode and 830m3/h in normal operating High Power mode. Standard in the kit is a 5.0Ah battery, which has an impressive runtime for a machine of this type – 18 minutes in boost mode, 30 minutes in high-speed mode and 180 minutes in low-speed mode; although I can’t see the low-speed mode used very often by most operators. The 5.0Ah battery can be recharged with the included rapid charger in just 40 minutes. A charge indicator light on the battery informs the operator that it requires charging and the charger has bright, easy-to-see charge level indicator lights to monitor whilst charging. Two interchangeable nozzles are included in the kit, as well as a handy shoulder strap to reduce weight. A larger 7.5Ah battery is available to provide even longer runtimes and rather than inserting it into the machine it can be housed in a comfortable backpack. 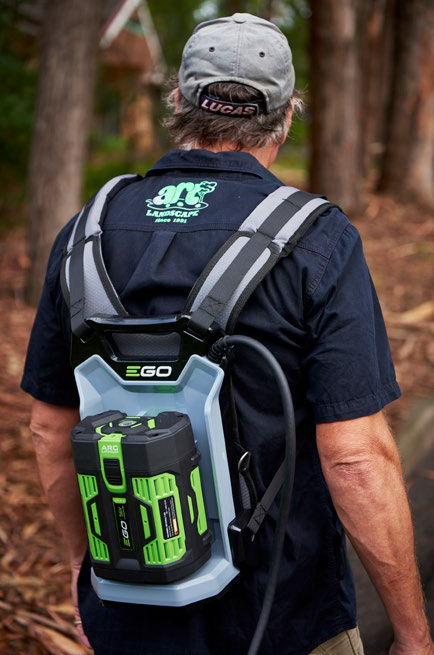 The battery snaps into the rear of the backpack harness, which is fully adjustable with padded shoulder straps ensuring the highest comfort levels for the operator. A cord from the battery is plugged into the blower and a lock-in guide on the front of the shoulder strap holds the cord out of the operator’s way. The cord is also long enough for the blower to be placed on the ground whilst the backpack battery is on the operator’s back. This came in handy when I needed to move obstacles and open a gate. 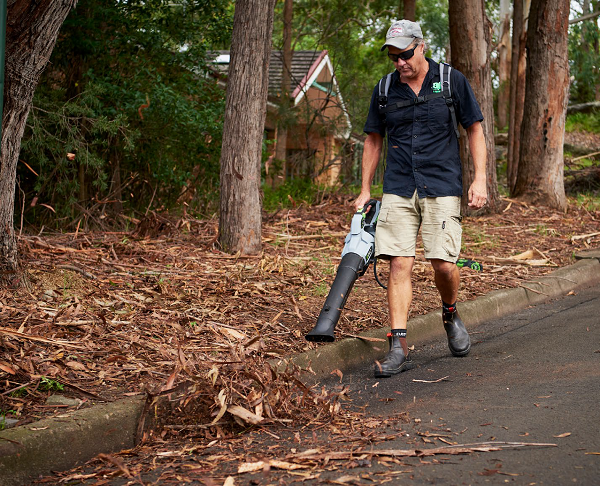 Operating the blower with the backpack battery greatly reduces the weight of the blower and makes it easier to manoeuvre especially in tight spaces such as stairs. 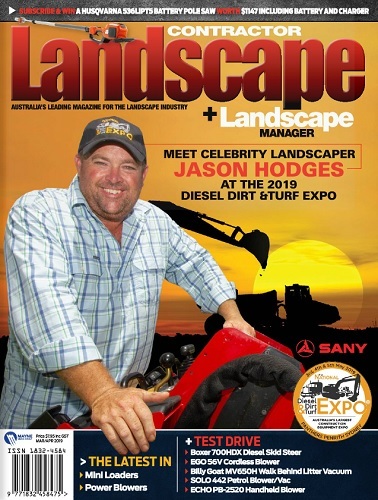 The reduced weight also enables the operator to blow large areas with minimal effort. 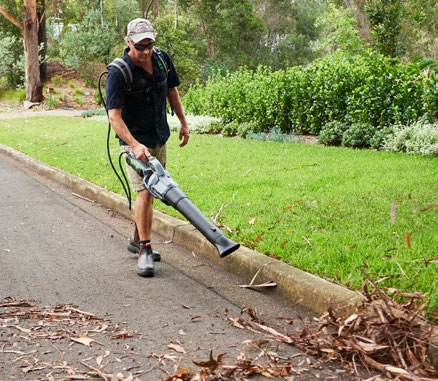 The EGO blower is extremely powerful for a battery-powered unit; easily equivalent to its petrol-powered rivals and the Turbo Boost button blasts away any adhered debris with ease. A variable speed throttle lock dial located on the left-hand side of the handle grip lets the operator set the blowing force at any speed in the range. This variable speed is a nice touch because many blowers of this type have a throttle lock, which only holds the throttle at full speed. 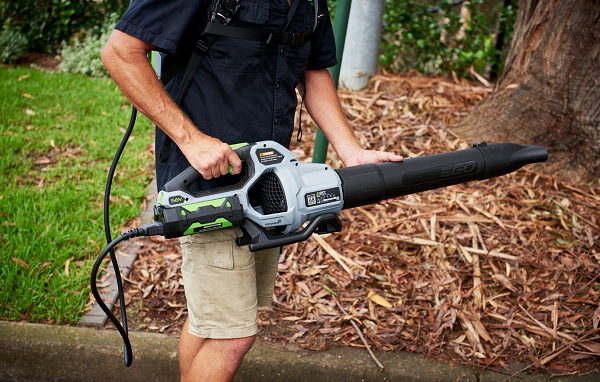 The EGO 56V Cordless Blower is one of the best and most powerful battery powered/hand held blowers I have come across and definitely worth a look for anyone in the market for this type of machine. It is fast charging, reasonable runtimes and comfortable operation with a backpack battery that adds to its appeal.